Home Agriculture CNN Commodity Title Conservation Direct Payments Farm Bill Farming CNN Visits the Farm! So this was an exciting week for us on the farm. We had the opportunity to host Dana Bash, Senior Political Correspondent for CNN on our farm. 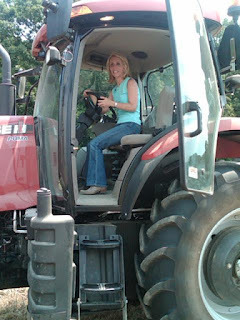 She was doing a story on the Farm Bill and wanted some farmer perspective. Due to our proximity to Washington DC, its not unusual for us to have reporters, foreign visitors, and other groups or individuals wanting to come talk about one aspect or another about farming and agriculture. Since the Farm Bill is currently being discussed in the Senate, it was timely for this interview to occurr. Dana Bash with CNN however, is probably the most well-known media person we've ever hosted on the farm, besides politicians themselves. Dana Bash and her camera man interviewing my husband Hans. We always get first time visitors to drive a piece of equipment. Here Dana Bash does a good job helping us bale hay. So you may be wondering what the big deal is about the Farm Bill? 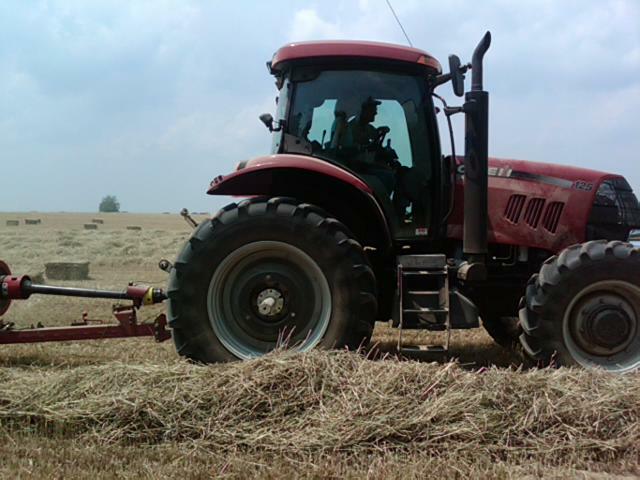 The Farm Bill is the policy and budget by which most all our food and agricultural production is based. It is a 5 year policy last revised in 2008 so 2012 is the year of its revamping and it is currently creating a lot of discussion with politicians and the media. The vast majority of the funds allocated in the Farm Bill are for food & nutrition programs for the poor, underserved, and child nutrition like school lunch. The remaining funds go to farm payments, conservation practices, crop insurance, specialty crops, and other agricultural titles. As you can see from the pie chart below, food stamps and child nutrition make up 73.3% of the current 2008 Farm Bill spending. One of the hot topics and what brought CNN to our farm is the issue of direct payments to farmers. You can see by the pie chart above under the Commodity Programs Title, that direct payments make up 10% of the current spending in the 2008 Farm Bill. Direct payments have been in the Farm Bill since the 1930's. Direct payments have for years been consider the safety net over which we farmers operate. In a vast number of years, the income from farming has often been below the cost it takes us to actually grow the crop. But to ensure a stable food supply, the federal government has essentially underwritten the "floor" of our food by providing direct payments to farmers. In the last 4 or 5 years, grain prices have been good and farm income has improved so there is less need for direct payments, thus the discussion of doing away with them while still providing a farm safety net through enhancing the crop insurance title. There are farmers on both sides of the coin with regards to the issue of direct payments. You'll hear in this video clip aired on CNN that we are in agreement that direct payments should not be part of the 2012 Farm Bill. Our opinion is by giving up direct payments is doing our part for fiscal responsibility to lower the US deficit. We do however strongly advocate for improved crop insurance. 2011 was one of our worst years on record and we would be deeper in debt if we had not purchased crop insurance coverage. So if you watched the video in the link above, you heard my husband say we receive $35,000 annually in direct payments. What you didn't hear that got cut out of the interview was that he continued on to say that the direct payments we receive are used to implement conservation practices to improve the water quality of the Chesapeake Bay Watershed where we live. Let's be clear, direct payments are not pocket money for farmers to go spend. They are re-invested into the farming operation. 1. The insurance premium we pay out of pocket for our crop insurance policy on an annual basis surpasses the amount of the direct payment. That does not include our specialty crops like green beans, tomatoes, and winegrapes which are uninsurable in Maryland. 2. The conservation tillage equipment we purchased for protecting our soils from erosion and improving water quality was more than double and triple what we receive in direct payments. 3. The precision agriculture technology we purchased which decreases our fertilizer applications reducing the amount of nitrogen and phosphorus we apply to our fields surpassed what we received in direct payments. 4. Our fuel bill for our fleet of trucks and tractors to get the crops planted, tended, harvested and delivered well surpasses the compensation from the direct payment. Farming is not a cheap business. It takes capital to grow your food. If you appreciate your safe, healthy, and economically priced food, it is due more in part to the smart efficiency of today's US farm families, and less due to the direct payments of the Farm Bill. That simply gives the Federal Government way too much credit. Let's give credit where credit is due, to the hard working farm families like mine who work to provide you with safe and nutritious food for your family, often inspite of governmental policy and regulations that make farming a challenge.